In times like these, no business can afford to waste money. So why pay more than you have to for your printer cartridges? Visit us on stand 78 at the Business North West exhibition to discuss the substantial savings we can save you on the cost of manufacturers’ own cartridges, whilst still enjoying the same high quality prints that you would normally expect or your money back, guaranteed. 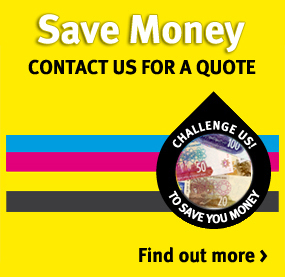 Cartridge World refills all major brands of inkjet and laser cartridge, using specially formulated inks or toners to match the original cartridge, so you’re guaranteed the very best print quality. 1. Reduce business running costs. Why pay more than you need to for printer cartridges when you can have an affordable alternative without losing quality. Think about what this could save you within a few short months? 2. Free collection and delivery service. Why suffer the hassles and costs of travel when you can have the cartridges delivered to your door*. 3. Account facilities. To help your cash flow we can set up account facilities swiftly**. 4. Membership is FREE and EASY. It costs nothing to join and could really save your business money. Don’t wait – join today! 5. Warranty Worries Disappear. Don’t worry – using a Cartridge World printer cartridge will NOT invalidate your printer’s warranty. Relax and enjoy making the savings! 6. Go Green. Here is how your business can do more to protect the environment because not only are you saving your business money your business is saving cartridges from landfill. *Subject to minimum order value. Find Cartridge World at stand 78, Business North West on the 28th - 29th October, Manchester Central (formerly G-Mex). For a no-obligation review of your office printing costs, please complete and submit the form below. Or call 0800 21 55 99 3 to contact one of 54 local stores in your region for a no-obligation review of your office printing costs.